Sam and Gilly are two high school girls - outcasts really, hanging out at a convenience store. A strange homeless man tells them that if they run fast and leave everything behind, they can catch "the Witches' Carnival." They travel with Christopher Marlow (!) and the rest of the witches all over the US and England on a psychedelic journey that has them stealing money, a car, and has Gilly (the gay teen of the two friends) falling for a female witch! 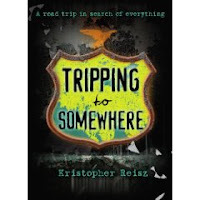 Add your review of "Tripping To Somewhere" in comments!